Best known as the bomber used by Jimmy Doolittle for his raid against Tokyo, Japan on April 18, 1942, the North American B-25 Mitchell became the backbone of the U.S. Army Air Force medium bomber campaigns during WWII. 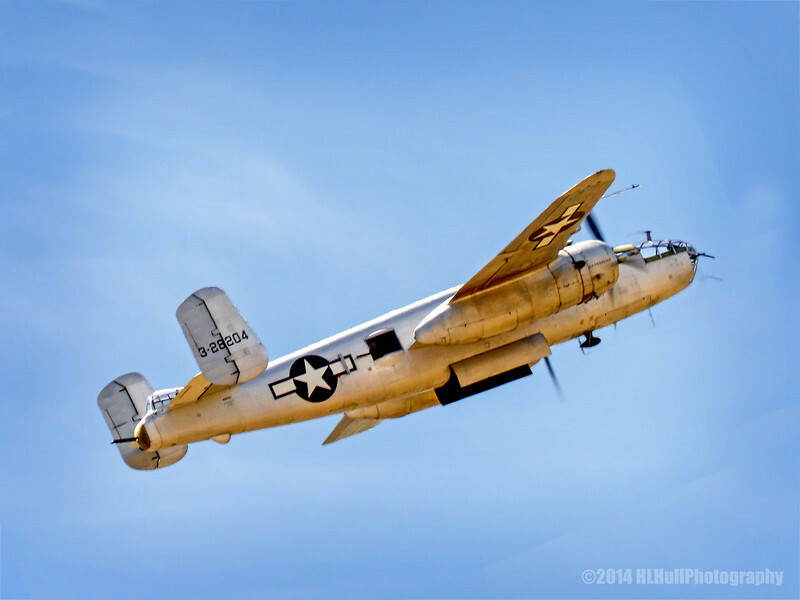 Along with its counterparts, the Martin B-26 Marauder and the Douglas A-26 Invader, the B-25 performed up to and beyond its original design expectations. During the war, B-25s served in both the European and Pacific Theaters of Operations flying a wide variety of missions, including medium and low altitude bombing overland and anti-ship operations at sea. Very heavily armed for both defensive and offensive purposes, the B-25 could be fitted with as many as 18 heavy .50 caliber machineguns or a 75mm cannon and up to 14 machineguns, thus turning the bomber into a very formidable gun platform for strafing missions against shipping and ground targets, including strong fortifications and armored units. During WWII, North American Aviation produced over 10,000 Mitchell bombers in a total of 10 major variants at plants in Inglewood, California and Kansas City, Kansas. In addition to service with the U.S. Army Air Force, those bombers were also used to good effect by the U.S. Navy and Marine Corps and the air forces of 17 foreign countries. The last operational B-25 was finally retired from the U.S. Air Force inventory in January 1959. Carrying the serial number 44-30423, Planes of Fame Air Museum's North American B-25J Mitchell was built in Kansas City in 1944.